Once a village with absolutely no water and green cover today has lush green farms producing bumper quantities of fresh vegetables, orchards exporting pomegranate to gulf countries, farmlands selling bags full of grains, blooming forest and thriving livestock. It is the reality! 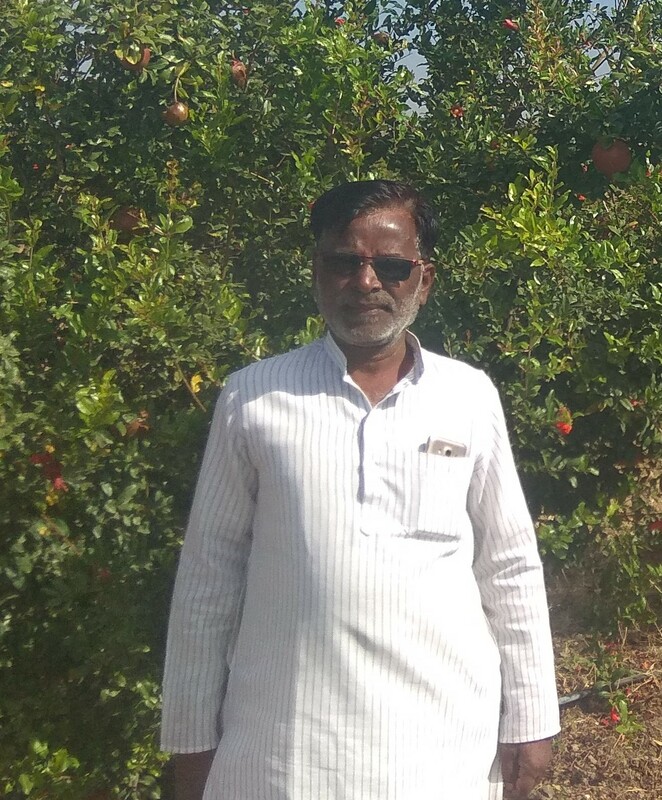 In 10 years Kadbanwadi village, Indapur taluka, Pune district, Maharashtra have been completely transformed due to the self-less efforts of one man, Mr. Bhajandas Vitthal Pawar. He has given a new lease of life to his village by constructing systems for water conservation. In 10 years (1994-2004) along with co-operation from villagers and financial aid from various government schemes Kadbanwadi became water-sufficient village with 100 farm ponds, 27 cement bunds, 110 earthen bunds and 3 percolation tanks. “We are consistently progressing towards growth and development of the village by expanding our water conservation systems and infrastructure,” he highlights. Once the water was secured, villagers aka farmers resumed farming in the year 2005. Earlier they were primarily growing sugarcane, sorghum (jowar) and pearl millet (bajra) but later diversified into fruits and vegetables as well. “We have to grow multiple crops for all 12 months for consistent flow of cash. We decided to grow pomegranate. Our village has 1600 hectare of farmland in which now we have pomegranate cultivation in 500+ hectares. We produce residue-free pomegranate having premium quality. It is sold in nearby cities, metros and exported to gulf countries. We have even exported small quantities of pomegranate to Europe. Recently we have also started growing custard apple,” states Mr. Pawar. Sunflower and groundnut is also grown in the village. Vegetables were other crops that farmers of Kadbanwadi village explored and got benefitted. “We get bumper crops in vegetable cultivation. These are sold in India as well as exported. It is mostly grown in open cultivation but due to climate change some of us have installed shade nets. Approximately 10 acre area has shade nets and poly house. The quality of coloured capsicum and European cucumber grown in our poly house is very good thus goes for exports,” he affirms. Kadbanwadi village has conserved water in best possible way and farmers continue to save and utilize it in most proficient way. All the farms in the village have drip irrigation to make best use of every drop of water. 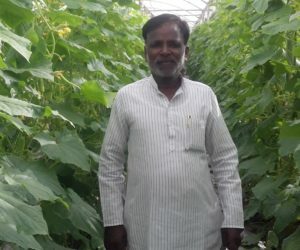 “We are using chemical inputs in minimum quantity and more of natural farming products so that our soil is fertile and water requirement for the crop is less,” he says. Mr. Pawar also treasures 522 hectare natural forestland in the village vicinity. “The forest has rich flora and fauna precisely deer. It is the main attraction of this forest. To safeguard the forest wealth we are constructing a huge bund and pond to increase the grassland area and provide facility of drinking water for the animals respectively. We have received Rs. 1 Crore for this program and to develop agri-tourism center in association with MTDC (Maharashtra Tourism Development Center),” he reveals. In time to come he wants to work vigorously in organic farming so that the village gets renowned for healthy and nutritious food production. 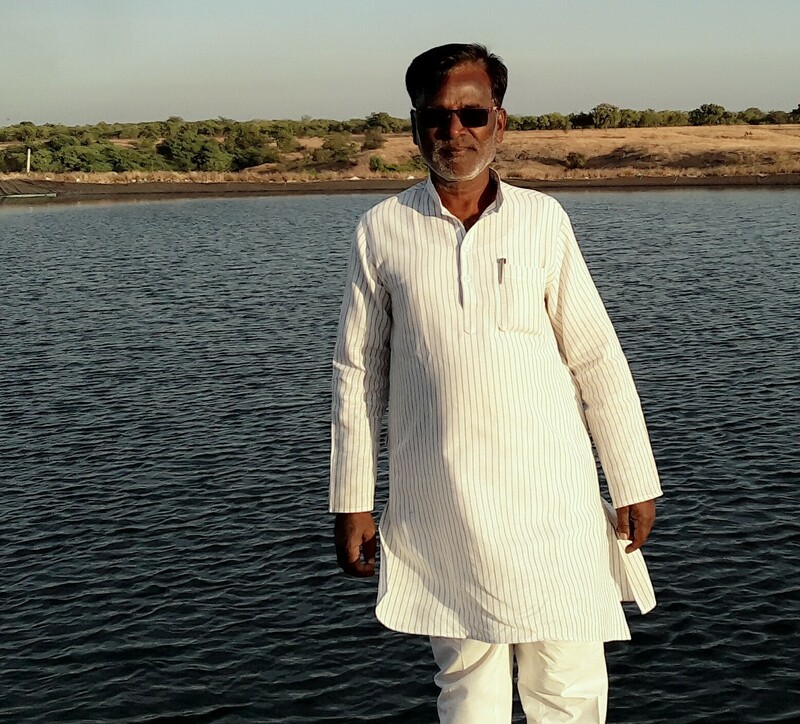 By learning and implementing the latest technology on water conservation Mr. Pawar has brought fortune to his village. It was not easy for him! He worked for the welfare of Kadbanwadi village along with his government teaching job at Saraswati Vidyalaya, Ravangaon, 48 km away from his home. Every day in the morning and evening he used to interact with the villagers and lead the water conservation program. He got retired in 2012 and since then is engaged full time in the development of his village.